India witnessed a considerable decline in tobacco-related cancers between 1990 and 2004, according to the latest report by the Indian Council of Medical Research (ICMR). The premier research body has also claimed that tobacco habits in females in India did not reach alarming levels as in other developing countries, and can be checked with suitable interventions. The National Institute of Medical Statistics at the ICMR has published a statistical evaluation of tobacco-related cancers in various states of India in the latest edition of Journal of Clinical and Diagnostic Research, inferring that such cancers are on a decline in major states of the country, including the Capital. The statistics between 2004 and 2015 are still being compiled. Mumbai is leading in curbing the tobacco-related cancer menace followed by Chennai, Bengaluru and Delhi. The incidence rate of cancer available from the consolidated reports of the National Cancer Registry Program of ICMR for 1990-1996 and 2001-2004 were used for analysis and computing proportion of tobacco-related cancers, which included population- based cancer registries at Bangalore, Bhopal, Barshi – a rural registry in Maharashtra, Chennai, Delhi and Mumbai. Tobacco-related cancers occur in oral cavity, lip, tongue, oropharynx, hypopharynx, pharynx, oesophagus, larynx, lung and urinary bladder. “There was a significant decline of proportion of tobacco-related cancers from 1990-96 to 2001-2003 for all the registries, except Bhopal, where around 50 per cent of the total cancers attributed to tobacco habits for the two time periods are under consideration,” said Dr Atul Juneja, ICMR, the main author of the report. There was a decrease in tobacco-related cancer cases by 2.37 per cent in Bengaluru for the two said periods, 1.32 per cent in Barshi, 2.59 per cent in Chennai, 1.30 per cent in Delhi and 4.11 in Mumbai, respectively. As far as the decline among women is concerned, Bangalore recorded a decline by 1.1 per cent, Barshi by 3.3 per cent, Bhopal by 0.93 per cent, Chennai by 1.3, Delhi by 0.33, and Mumbai by 2.18, respectively. In India, tobacco-related cancer deaths account for 42 per cent and 18 per cent among males and females, respectively, in age group of 30- 69 years. As per data available from National Cancer Registry Program, tobacco-related cancers in men account for about 40 to 50 per cent of all cancers while in females, they account for around one fifth of cancers. 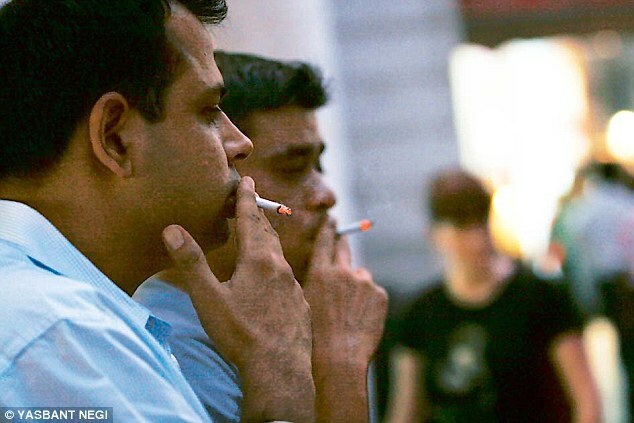 WHO predicts that tobaccorelated deaths may exceed 1.5 million by 2020. “Intensive health educational campaigns can help in controlling significant number of cancer cases that are tobacco related. 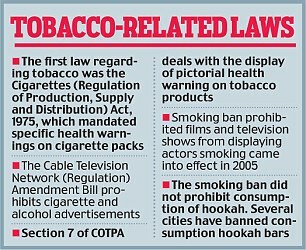 It is not only active tobacco habit which is a matter of concern but also passive exposure that a person gets by occupation, such as working in tobacco industry and tobacco fields,” said Juneja.